I cried when I left :)- I really enjoyed my stay, the house and location. Company is terrific. Only real complaint about Ecola Haven is the shower -- would either scald you or freeze you w/ no warning, and there's hardly any water pressure. Very helpful staff getting us close to where our Family Reunion was being held. Couldn't have asked for a closer place to stay with money saved too by getting a condo to rent instead of a hotel room. Thank you. Amazing staff and great customer experience! Your service seems to have moved to an even higher level since our last visit 4 years ago. Well done because it was already very, very good. Thank you for working with us. It was a difficult situation we were all put in when the first property was pulled from the vacation rental list. Sea Breeze was a perfect solution. 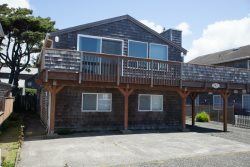 Cannon Beach Vacation Rentals once again met our needs and assisted us to find a great vacation spot. Thank you! Everything was great! Your staff was very helpful and welcoming and all was ready at the Castle. We appreciate you, thanks for making our stay great. It was a great vacation condo. It had everything we needed and was easy to entertain a small group. The location was great and it was nice to be farther away from the downtown area, but still in walking distance to the beach, Haystack, a grocery store, and bakery.